Many Futuras are finding their way into the second hand market minus their toolkits or missing the odd item. This page details what should be in the pouch under the seat. Some of it you’ll need, some of it you can live without. The list below comes from the owner’s manual, which you can download from the links to the right of this page. 22mm Allen key – Fits into a 22mm socket for undoing the rear wheel. You WILL need this. There’s also prop rod for the fuel tank clipped to the underside of the seat. 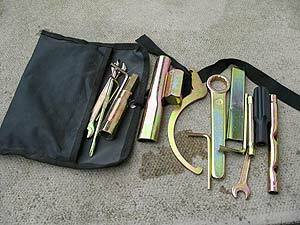 The obvious omission here is a proper pin spanner to remove the dust cover from the rear wheel. 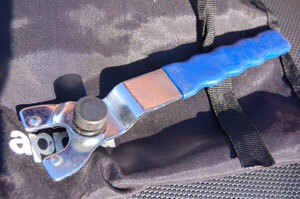 The cheapest way to remedy this is to buy an adjustable pin spanner of the type used the change angle grinder blades. This can be carried in the toolkit and shouldn’t set you back more than a couple of pounds. It’s the basics but some tools, for example the chain adjuster and the bit for the rear wheel, you’ll really need to work on the bike.